Berliners Jazzanova formed Sonar Kollektiv with a wide cast of characters which included musicians, DJs, graph designers, artists, and even some friends and family. Coming up to their tenth year in the business, they are marking the occasion with a two disc compilation. 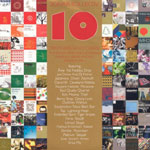 Disc one is a collection of all the best from the past ten years with a chilled out feel. The second comes premixed by the Jazzanova crew and steps the beat up a bit. With artistry written all over this one, long time fans as well as first time listeners with no doubt be impressed. "Ten Years / Who Cares?" will be released June 18th.